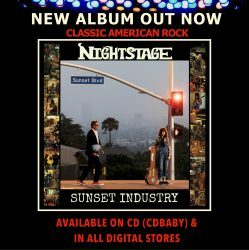 Recently, Los Angeles-based band Nightstage released its debut album “Sunset Industry”, an album recorded in Nashville which is full of classic-sounding American rock music. Nightstage’s core duo, father-and-daughter team Max Foxx and Nicky Renard, is backed up by a band of seasoned music industry veterans from the American rock scene. Roppongi Rocks checked in with 16-year-old co-founder, songwriter and lead guitarist Nicky Renard in Los Angeles to talk about her role in the band, the debut album and what’s next for Nightstage. Jake E and Cyhra, the band he formed with former In Flames guitarist Jesper Strömblad, kicked off their summer festival season in Europe yesterday. Roppongi Rocks checked in with the former Amaranthe frontman to talk about the work on Cyhra’s next album. Since you released the album last October, you’ve gained a new member (guitarist Euge Valovirta) and lost one (bassist Peter Iwers). What impact on the band and the songwriting have these changes had? “Euge played on the debut album but it was originally not planned that he was going to be a permanent member. But since he is a fantastic guitarist and also a fantastic human being it was a no-brainer to include him as a permanent member. It is a pity that we lost Peter. He too is a great human being and the best bassist I’ve ever played with. However, time didn’t allow Peter to be 100% involved with Cyhra and thus he chose to step down. There’s absolutely no bad blood between us. We’re still great friends. It is I and Jesper who are the musical motor of the band, although Euge has contributed with many great ideas. It will be interesting to see where this leads. The new songs are a natural continuation of ‘Letters’. It is incredibly creative and fun to write album number two now that we know a bit more about how the fans react to our music when we play live. Cyhra is a fantastic live act and I feel that the new material is, even more, audience friendly”. For readers in Europe, Cyhra will next be on stage at the mighty Sweden Rock Festival on Wednesday 6th June. Swedish modern melodic metal band Amaranthe is working on its fifth studio album which will also be the first with new vocalist Nils Molin of Dynazty fame. Roppongi Rocks checked in with Elize Ryd, one of Amaranthe’s three vocalists, for a quick update on the new album. When German thrash metal band Destruction returned to Japan to kick off their Asian and Australian tour with a show in Tokyo, Roppongi Rocks’ Stefan Nilsson met with vocalist and bassist Schmier backstage before the gig. Mike Sifringer (guitar) and Schmier (vocals and bass), who co-founded thrash metal band Destruction in Germany in 1982, recently lost their drummer Vaaver. Thus they turned up with hard-hitting German-based Canadian drummer Randy Black (ex-W.A.S.P., Annihilator, Primal Fear) as a fill-in drummer for this tour. Not a bad substitute. Shortly after our chat, Schmier, Mike and Randy walk on stage and deliver one of the best gigs of the year in Tokyo. Proper German thrash metal delivered by a veteran band that still got it. What a show in front of a sweaty Tokyo crowd loving it. Thrash attack indeed! Formed in London in 1974, British rock band Squeeze is still going strong. “We needed to justify being a band now as opposed to being a tribute band to our own past,” explains Squeeze’s founder and frontman Glenn Tilbrook as he sits down with Roppongi Rocks’ Stefan Nilsson at Billboard Live in Roppongi. “It’s good to be here. It’s really great to be here. One of my favourite countries in the world!” says Glenn Tilbrook of Squeeze as we sit down in the band’s dressing room before the first of two shows at Billboard Live in Tokyo. Tilbrook’s Squeeze co-founder Chris Difford is missing from this tour but the rest of the members of the latest line-up of Squeeze are here: Stephen Large (Pete Doherty, Babyshambles, Johnny Depp, Duffy) on keyboards, Simon Hanson (Death in Vegas, Hall and Oates, The Quireboys, The Dogs D’Amour, Rick Wakeman) on drums, percussionist Steve Smith (Dirty Vegas) and, the latest addition, bassist Yolanda Charles (Paul Weller, Robbie Williams, Aztec Camera, Mick Jagger, Dave Stewart). It’s a terrific version of the band. Glenn Tilbrook of Squeeze and Roppongi Rocks’ Stefan Nilsson at Billboard Live in Tokyo in May 2018. When Swedish melodic rock band H.E.A.T released its latest album “Into the Great Unknown” last September, they divided their fan base with a partly new musical direction. Roppongi Rocks’ Stefan Nilsson sat down with the band in Tokyo to discuss the thinking behind the album and the return of original guitarist Dave Dalone. Following the 2015 “Live In London” live album, which featured quite a lot of rock’n’roll, H.E.A.T’s new album, “Into the Great Unknown”, the band’s fifth studio album, is more focused on melodic rock and even some pop. The new catchy side caught some fans by surprise. H.E.A.T’s live set now contains more and more newer material. “Naturally we now play more from the three most recent albums with Erik. We’re playing fewer and fewer songs from the first two albums. We do play quite a lot from the latest album. It’s fun playing new stuff,” says Crash. “It’s becoming harder for every new album,” says Grönwall of choosing set lists. “We also got quite a lot of time to let things settle in and we could continue to produce at home. It was more detailed,” adds Jimmy Jay about the production of the album. “It is in contrast to how ‘Tearing’ was. That album sounded very ‘live’. On that album, we tried to retain the live feeling. I can catch myself sometimes when I listen to ‘Live in London’. On, say, ‘Inferno’, it’s hard to know which version is studio and which one is live. It is a very similar sound,” says Crash. With guitarist Eric Rivers exiting the band as they began the work on the new album, original guitarist Dave Dalone returned to the band after a few years of absence. “It just kind of happened,” says Dalone. “From our side, when there was a need for a guitarist, we went through what alternatives there were. We realised that Dave is the best!” says Jimmy Jay. Crash adds: “Keep it in the family! An hour after Rivers said he was leaving, I finally realised that he’s gone. Then the four of us sat down and the first thought that came up was Dave. Should we ask Dave back? That’s how we started to discuss.” Does Dalone see any difference with the band this second time around? “Yes, it feels a bit different now. Personally, I think I needed that break. It feels better now,” explains Dalone. Most of the material for the new album had already been written by the time Dalone was back in the band but he added his bits and pieces where he saw fit. “Someone writes the basic outline and then we all sit and create together in the studio. All of us are involved in songwriting all the way,’ explains Grönwall. H.E.A.T will now continue to do more gigs during the spring and summer. “And we will perhaps go out on another tour in the autumn,” says Crash, before they start to properly work on the next album. Who knows what we’ll get next time? No doubt it will be quality, no matter what genres H.E.A.T decides to tackle. Venom Inc talks to Roppongi Rocks about an unplanned reunion, being cheeky, writing very long songs and staying relevant. What a comeback! When the classic “Prime Evil” era line-up of Venom – Tony “Abaddon” Bray, Jeff “Mantas” Dunn and Tony “The Demolition Man” Dolan – reunited as Venom Inc a few years ago, I think many people saw it as a fun and nostalgic thing. Venom was founded 40 years ago in Newcastle in the north of England. It not only pioneered extreme metal, the whole black metal sub-genre was named after its second album. In August last year Venom Inc released the fantastic album “Avé” on Nuclear Blast internationally and Ward Records in Japan. It was one of 2017’s best albums and it became obvious that Venom Inc is much more than just a reunion and a celebration of the past. Venom Inc links the past, the present and the future. When Venom Inc recently returned to Japan for a second tour, I sat down with the band backstage before their Tokyo gig. While a bleak Cronos-led version of Venom has been out there playing shows, the proper legacy of the band seemed to have died. But then guitarist Mantas and vocalist and bassist Dolan reunited in 2010 in the band M:Pire of Evil and that was the beginning of something which in 2015 led to a proper reunion of a vital Venom under the name Venom Inc.
Abaddon continues to explain: “Me and Jeff were founding members of the band but Tony is a fan of the band. I think it’s fair for me and Jeff to say that we’re not particular fans of Venom’s music. You can enjoy playing it and enjoy writing it and enjoy taking it out on the road, but would I have bought ‘Black Metal’? I would have bought ‘Prime Evil’ after I heard it, but I don’t think I would’ve then gone back to the back catalogue necessarily. But to have somebody in the band who is a fan of the band and who gets the band, knows about the songs.” Dolan originally joined Venom as a replacement for Cronos in the late 1980s. 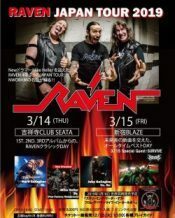 Venom Inc with Roppongi Rocks’ Stefan Nilsson in Tokyo. Well, folks, the Venom Inc boys are here. They have a past, present and future together. They’re relevant and they’re better than ever before. Shortly after our chat they walk on stage and deliver a devastatingly terrific metal show. Metal we bleed indeed.